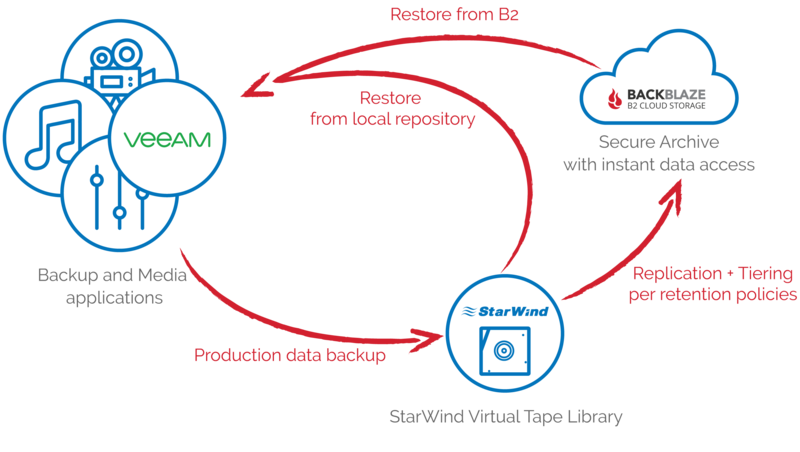 For organizations who want to automate their IT infrastructure and media assets backups while keeping them instantly accessible and less expensive to store offsite than LTO, our solution is StarWind Storage Gateway for Backblaze. Access your data anytime and securely store it locally with flexible tiering and replication to Backblaze Cloud Storage. Unlock true backup potential and forget about the inconvenience of shipping physical tapes offsite since the Gateway completely automates tape backup and archive. Leave your established backup process untouched as Backblaze Storage Gateway integrates into it with zero changes. Get a faster, more reliable local backup and archive that scales to your needs and only gets more cost-efficient over time. the amount of incremental data you backup each day. Then you can use the slider to compare your total cost from 1 to 10 years. You can run the model as many times as you like under different scenarios. For LTO backup - the Grandfather-Father-Son backup model is used and does daily incremental backups and weekly, monthly and annual full backups. LTO tapes are replaced once 1 year unless archived. Tape drive systems are 8-tape autoloader with single read/write head, cost is divided over 10 year of system life. Maintenance contract provides for onsite repair/replacement, next day service, parts and labor, 3 years, 9x5 coverage. full backup in 24 hours or less. Data downloaded is 10% per month of all data stored. Downloads are for data restores, etc. Currently only 2% of data stored with Backblaze B2 is downloaded in any given month. Upgraded bandwidth is based on 500 Gbps Verizon FIOS service in major metropolitan areas. The cost listed is incremental to any existing cost for Internet network service. Cloud Storage Service Level Agreement (SLA) for 99.9% uptime. For Cloud Storage, the data consistency software checks each file every 30 days. Tape Unit Cost - Future $5,000 Cost of a new LTO-8 Eight cartridge autoloader tape with 1 read/write head purchased down the road. Maintenance Contract $600 Cost per year for each LTO unit. On-site repair/replace service, next business day, parts and labor, 9x5 coverage. Time spent on LTO 2.5 For each LTO system: Hours spent each week working on LTO based backup/restore/maintenance activities. Network Cost (monthly) $400 Incremental cost to upgrade network speeds (symmetric 500 Mbps minimum). Backblaze Fireball is an import service for securely migrating large data sets from your on-premises environments into B2 Cloud Storage. Backblaze will send you the Fireball, a 70 TB hard drive array with 1 Gbps connectivity. Fill up the Fireball and return it back to Backblaze for a secure upload inside B2 data center. Solution integrates seamlessly and requires zero changes to the established backup and archive process. Fireball support allows moving backups of any size to B2 fast without any connectivity issues. The Gateway completely automates your backup and secures offsite archival by eliminating human process and the need to ship physical tapes offsite. It's not just less expensive than LTO. You get a backup and archive storage that scales to your needs and becomes more and more cost efficient over time.